I started inking this page in January. Then life intervened. A couple of times, I made random, bad efforts at finishing the page. I had Mr. Glasses inked, but the cliffside itself and the valley below weren’t inked. 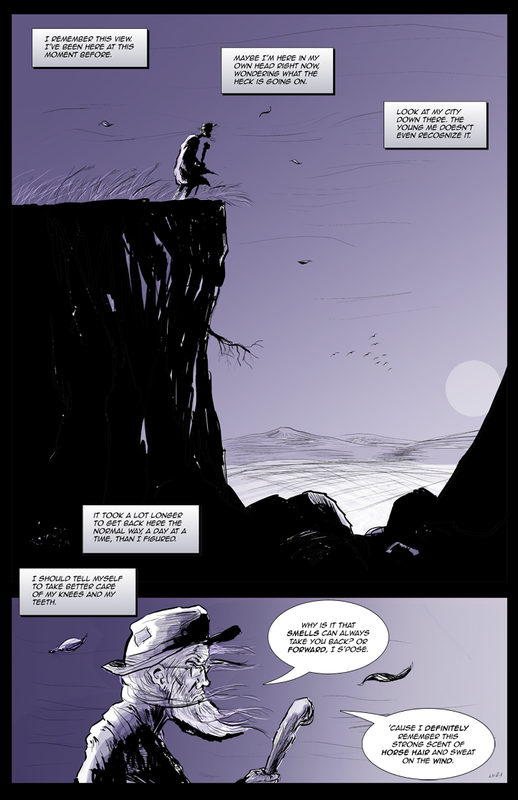 A couple of days ago, I realized that I should make the cliffside mostly one large black silhouette, which meant it was going to be much easier to finish inking the page than I thought. So I went ahead and did that last night, and it was pretty easy, and I liked the results. I wrote some captions and dialogue last night also, but I deemed them not good enough. I just spent at least an hour re-doing them all. Then rearranging them. Then rewriting them again. Then rearranging them. I think maybe more than an hour went into it. I think it’s pretty good now. A decent start. This doesn’t mean I’m going to be cranking these out regularly again. I’m mainly trying to work on stuff to keep from going crazy with depression. Either that or it’s my way of being crazy. Plus, as I said, I finally saw in my head what needed to be done, so now I’ve done it. I"m going to be a terrible tease and post it to Livejournal anyway. Page generated in 0.087 seconds. Powered by Xcomic . Design by JRW Digital Media.